Sensory processing (or sensory modulation) is the neurological process of how we regulate sensory information, and it is important for individuals to be able to refine and coordinate sensory inputs. Put another way, occupational therapists (OTs) often describe this mechanism as how one interprets his/her physical surroundings, and further how they see themselves in the context of their physical environment. For efficient sensory processing, one must be able to recognise and act on important inputs, while distilling unnecessary stimuli. Usually, this process occurs naturally and develops as the child grows. However, some children form developmental difficulties that may cause deficits in this evolution. How can I tell if my child has sensory processing problems? Hyposensitivity (poor sensitivity/awareness of their surroundings) – poor concept of personal space; appear uncoordinated or awkward or be involved in accidents regularly; may appear to be constantly looking for sensory stimuli, by touching others or objects even when it is inappropriate; have a seemingly steep pain tolerance. Oversensitivity or hypersensitivity – may object to or avoid physical contact; be uncomfortable or anxious in unfamiliar or busy settings; have intense reactions to noises or sounds that do not bother others. A child might avoid or have an extreme response to a situation with too much stimulus but might actively seek out something familiar for comfort. Having a “meltdown” in crowded or unfamiliar environments (e.g. a shopping centre) but have no issues at home or other commonplace settings. Assessing the child – children will have different sensory problems and the OT will perform assessments on the child’s behaviour and interactions to identify where processing issues may arise. 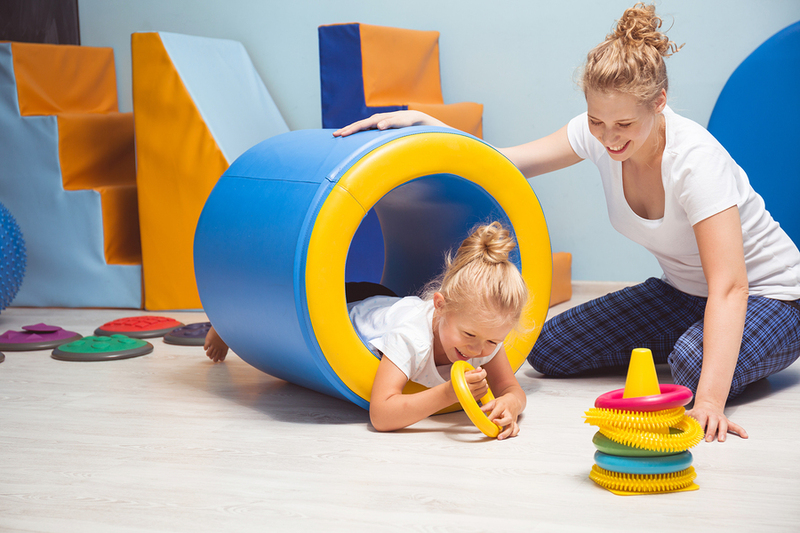 Utilizing specialised equipment (such as in a sensory gym) that enables the child to experience a variety of sensory environments, and perform physical actions (e.g. swinging, spinning). Expanding the child’s ‘sensory diet’, including various exercises that include developing tolerance to different weights, textures and temperatures. The therapy will also usually involve tasks that the child can attend to at home with their families/parents.